It is with great pleasure that I introduce our special “Cheese of the Fortnight” – Montgomery’s Cheddar. Yes, that’s right, my namesake in the cheese world. And, as you won’t be at all surprised to hear, I think it’s a good ‘un. Montgomery’s Cheddar is a handmade unpasteurised cheese made (with animal rennet) in North Cadbury, Somerset. To say we’ve struggled to find a good strong cheddar to slot into our cheese selection is putting it a bit high, but I wasn’t so Keen on Keen’s (another West Country Cheddar); Lincolnshire Poacher is a solid option, though I prefer the Double Barrel extra mature version. Montgomery’s, however, is impressive. A strong cheddar, with a real depth of flavour and an unusually dry texture (due to the curds being shredded with an old-fashioned peg mill, rather than sliced). Watch out for the odd blue vein – a sign of a traditional cheddar, matured in cloth rather than plastic. 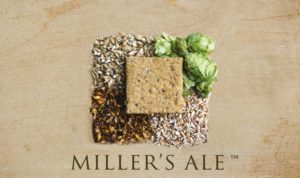 Fantastic with our Miller’s Ale crackers, which add bite from their thick cut and their hoppy, slightly sour taste.